the S001 Brings Fair-sounding music to your leisure and cozy entertaining time. Have one in a café, a restaurant, an vintage cloth shop or a dance studio. It integrates flawlessly into your room and matches seamlessly with the texture of your TV or home threater. As a new generation of HI-FI home stereo, sound quality values the most. Sound bar reproduced in an immersive, stunning and powerful genre. Connect the Bluetooth speaker to your Smartphones, tablets or laptops via Bluetooth or to your conventional music players by using the included 3.5mm audio cable to start your own music entertainment in just one step. Skip tunes and nearly all playback control can all be operated on the stereo or the remote. Enjoy your music, your lyrics and your soundtrack in a unique and highly personalized style. 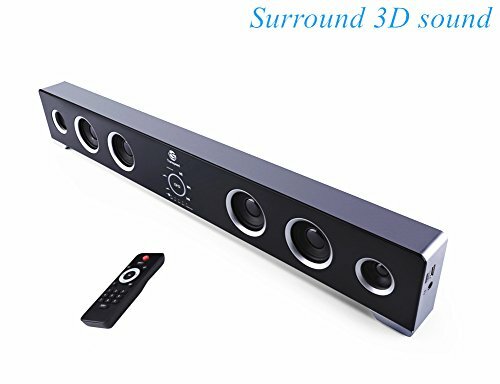 Surround sound -- This soundbar can emulated a six-speaker surround system, which brings virtual surround sound. You can enjoy movies, music, TV shows, news and games. It brings you an upgrading fantastic home theater experience. 2018 NEW MODEL PROMOTION-This model is one of the major item of our brand in 2018. It has a beautiful outlook and high quality, designed by Famous German designer. It's a really the best choice for a great price. Wired or Wireless Connection -- With Bluetooth 4.2, the soundbar can pair with your device in seconds, Your iPhone, iPad, Samsung and any smart devices can work with this home audio speaker via Bluetooth & EDR (effective distance: 33 feet/10 meters) for a true comfortable wireless experience, or wired connections that include AUX, RCA input or USB. 5EQ Modes - The soundbar provides 5 EQ Modes which include pop, jazz, rock, country, classical mode(the user manual in the package described that EQ mode is unavailable, actually we have already updated the speaker and EQ mode is available now,but you can use EQ function only when BLUETOOTH or USB/TF mode playing.). You can choice the mode to fit your feeling. Place Below or Above - Set the soundbar under the television or mount it on the wall for a convenient and elegant set up. Either way will give sound that rocks the house. And we promise 40-day money back guarantee and 1 year hassle-free warranty with considerate customer service. If you have any questions about this product by Transpeed, contact us by completing and submitting the form below. If you are looking for a specif part number, please include it with your message.